I've been backpacking for 45 years and regularly in the Rockies since 1986. I do at least one weeklong trip every summer, and often take three-day trips. I'm usually camping in alpine terrain, at altitudes 5000 to 10000 ft (1500 - 3000 m). I prefer base camp backpacking, a long hike in with day trips from camp, but I do forced marches too. Recently I've been actively reducing my pack weight, though I still usually include my favorite camp conveniences and always sleep in a floored tent. The product’s name is descriptive. 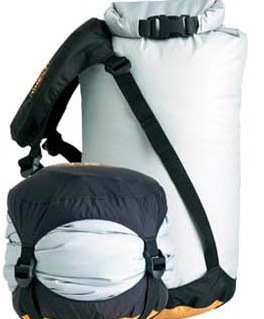 This is a standard compression sack with a dry bag closure at the top. Where it’s special is in the material used – the base is made of eVent�, a fabric I’ve sought out for rain gear but never before seen in a storage piece. According to Sea to Summit, use of this waterproof breathable fabric allows compression without a valve. Pressure forces air out through the fabric, but (so long as the sack is not submerged for extended periods) water can’t get in. Website: http://www.seatosummit.com The photo in this Initial Report comes from this site. Fabrics: eVent for the base, polyurethane-coated 70 D nylon body and lid. This is a carefully and well-made product, with all seams double-sewn and taped. Four equal-sized compression straps with heavy plastic threading clips allow cinching down. Sea to Summit notes that these are triple bartacked; I have no idea what that means. The information sheet that accompanied the product contains several admonitions on use and care, most of which are also on the website. Many of these are standard and obvious, e. g., avoid contact with sharp objects or heavy abrasion, and double-bag electronic devices. Somewhat out of the ordinary is a warning against exposure to solvents, such as DEET, which can damage the waterproof coating. It works as advertised. I jammed a sleeping quilt, down sweater, and some clothing into the sack, closed the roll-top closure, and then pressed out the air inside by cinching down the straps on the compression straps. Hey presto, a compressed container without having to open the top seal to scrunch it up. One other much-appreciated feature is a grab handle on the bottom. I packed this dry sack for a reason – tomorrow I leave for a backpacking trip in Montana, so the Sea to Summit event Compression Dry Sack will get its first field testing very soon. The Sea to Summit event Dry Sack has accompanied me on two backpacking trips: a five-day service trip in the Mid Creek drainage of the Bob Marshall Wilderness Area in northwest Montana in late June, and a four-day llama-supported hike in the Upper Gallatin River Valley in the Montana section of Yellowstone National Park in late August. On the service trip we had warm working weather – daytime highs about 85 F (29 C) and bright sunlight, with no precipitation. On the eleven-mile (18 km) hike to our campsite I carried the stuffed Dry Sack in my pack. Its contents were my Nunatak Arc Ghost sleeping quilt, MontBell EX Light down jacket, and three extra pairs of socks. (The first two items are separately reviewed on this site, so you may check dimensions.) This load did not fill the Dry Sack to capacity; after making use of the stuffing feature I had a bag about 14 inches (35 cm) long. In Yellowstone I brought a different quilt and sweater – my oversized Nunatak Back Country Blanket and Skaha down sweater. (Again, you may check my separate reviews for these products’ dimensions.) After adding a watch cap the Dry Sack was almost full. 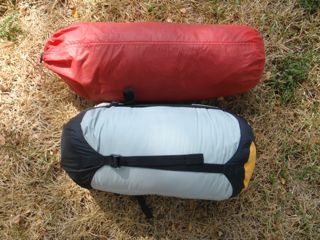 From the photo at left, you can see that when stuffed to capacity this size Dry Sack is slightly shorter but wider than a packed-up solo tent. We met with typical late summer Montana weather – highs about 90 F (32 C), down to 40 F (5 C) at night, and mostly sunny with a brief thunderstorm every afternoon. The Dry Sack went to and from our camp in a pannier on a llama. Capacity is just right. Not only does the Dry Sack provide waterproof protection for the two down items I regularly camp with, even when full (as in Yellowstone) it fits across the bottom of my regular weekend pack and the larger (85 L/5200 ci) pack I use for my service trips. I’m used to packing my sleeping bag at the pack’s bottom, a vestige of my expedition days when my pack had a separate sleeping bag compartment at the bottom, and general good sense – it’s nice to have a firm but not rock-solid or sharp-cornered item pressing against the small of my back. The Dry Sack is easy to use. It works in the same manner as any other compression sack, with the top placed over the dry bag closure and then cinched down with the straps that are threaded through buckles. So far I’ve had no sticky or loose straps and (rather unusual for me) no strap becoming twisted inside the buckle and not allowing full compression. What about waterproofing? I’m sorry to say that I haven’t been able to test this signature feature, as I’ve met with no rain on my hikes, and once in camp the Dry Sack stayed inside my tent. La Ni�a-generated rains swamped the Northern Rockies with one of the heaviest snowpacks and wettest springs ever recorded. On the Bob Marshall hike the South Fork of the Flathead in June was the highest I’ve ever seen it, and even in late July none of the rivers near Bozeman, Montana, which I visited for two weeks, was safe for packrafting. The Gallatin River in Yellowstone near our campsite is little more than a slow-moving creek meandering through meadows, not big enough for watercraft. I’m hoping the autumn will bring some better river conditions. The Dry Sack has held up well and looks almost as good as new, though it picked up one smudge on the Yellowstone trip. But then it’s either been inside a dry pack or a dry tent almost all the time. The one exception was on its way out of the Bob Marshall Wilderness. I had to leave the service trip a few days early to attend a wedding, and the Forest Service volunteered to pack my sleeping bag out for me. Unfortunately the horse on whose back the Dry Sack was stowed met with an accident, and the contents of its panniers were strewn across a hillside for several days until the Forest Service kindly retrieved it. So maybe my Dry Sack felt the rain after all. The Dry Sack, like many stuff sacks, often serves as my backcountry pillow. I’ll fill it with clothing, tighten things up, and place it at the head of my sleeping bag. A good size for me – fits my pack and my sleeping bag and down sweater fit inside. Now that I have completed this Test Report I can officially say that the Sea to Summit eVent� Compression Dry Sack has become my favorite stuff sack. I have nothing but good things to report about this versatile and functional storage piece. An overnighter in mid-September near Fort Worth, Texas. This was during Texas’s near-record hot summer, and it didn’t get much below 80 F (27 C) that night, and this night wasn’t the one day since June that North Texas experienced any rain. The Sack’s contents were my sleeping quilt (which I probably should have left at home), a bathing suit, a spare t-shirt, and a spare pair of socks. A four-day, three-night backpack along the Shoshone Lake, Bechler River, and Bechler Meadows Trails in Yellowstone National Park, Wyoming and Idaho, during the first week of October. 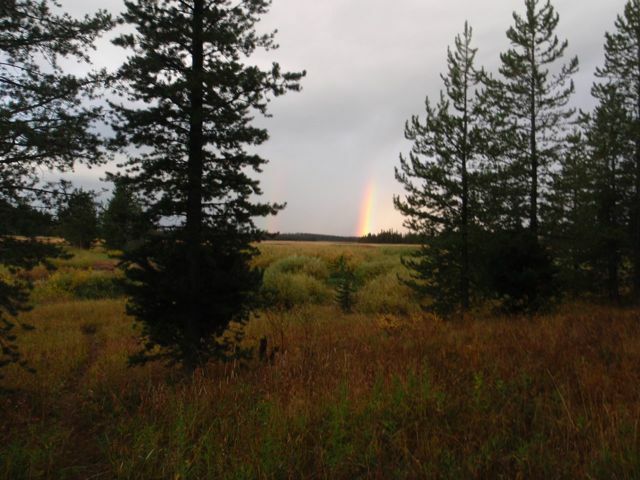 This trip broke the Sack’s shutout streak – it rained every day, from a pleasant sprinkle on the first morning to several downpours on the final night and the following morning hike to the Bechler Ranger Station, the trip’s terminus. Temperatures ranged from about 40 F (4 C) at night to 75 F (25 C) on two afternoons. I stowed my sleeping quilt (regular size – not the oversized one mentioned in my Field Report) and down sweater in the Sack. I add little of significance to my Field Report comments on capacity and ease of use. The size M Sack mates quite well with all three packs I’ve worn during the four-month test period. Since the Dry Sack comes in several larger and smaller sizes, if I acquire a new pack I can find a Dry Sack to fit it. I like the fact that the closed end of the Dry Sack has a grip. This makes it much easier to extract a compressed sleeping quilt. Finally I had the chance to see how well the Dry Sack repels water, thanks to the rain on the Bechler trip and an accident with my water bladder on the overnight hike. On the hike out on the overnighter something in my pack punctured the water bladder in my pack, nicely soaking everything else inside. As the Dry Sack was at the bottom of the pack, it bore the brunt of the two-liter deluge. In Yellowstone the stuffed Dry Sack was exposed to a shower when I thoughtlessly left it outside my tent during fishing and rainbow-watching on our last morning in camp. The Dry Sack, which I had packed for our hike back to civilization, probably received twenty or thirty minutes’ direct exposure to moderate rain. Results were identical. After each incident I opened the Dry Sack to check its contents and each time found not one drop of water inside. Can’t beat that. The Dry Sack’s workmanship and materials have stood up well. I’ve found no fraying, loose threads, or other deterioration after seventeen days of being stuffed inside my pack. There are a few smudges here and there; I suspect most came from a dirty head and oily hair when the Dry Sack was used for pillow duty. Sea to Summit doesn’t provide care instructions beyond noting that spot cleaning usually suffices for any of its stuff sacks and dry bags. However I have two jackets made of eVent, and the instructions that came with them encourage frequent baths in the washing machine. (Perhaps counterintuitively, fabric DWR treatments such as eVent benefit from proper washing.) After my Bechler trip I ran a load of eVent and GORE-TEX items through the washing machine, using non-detergent soap and warm water, followed by an afternoon drying in the Texas sun. This treatment did away with the smudges and now the Dry Sack looks like new. The proper size for two down items I regularly pack (and available in other sizes if my needs change). Using eVent, a state-of-the-art waterproof/breathable fabric, for a mundane item like a stuff sack may appear to be extravagant, and $35 is expensive for a stuff sack. On the other hand, what value would you place on a guarantied dry sleeping bag? As a certain credit card company might say, priceless. I’m thoroughly pleased with the Dry Sack and will likely buy some more, in different sizes, for packrafting next summer. My Test Report ends here, with many thanks to Sea to Summit and BackpackGearTest.org for this testing opportunity.